You may have heard we got hit with 12+ inches in Boston last week. Ah….there’s nothing like that first big snow fall, the dazzling snowflakes…blowing horizontally in the shrieking wind of the “bomb cyclone.” Someone needs to give the weather people more to do — they have way too much time and fun at work making up scary adjectives for storms, which we in these parts are happy to just call a naw’eastah, thank you very much. The rest of us don’t get to make up words at work, so why should they have all the fun? Despite the storm’s doomsday descriptions, I survived with heat and electricity intact. However, it wasn’t until the next day that I understood the real terror of the storm… The Space Saver. Now that I am in a new neighborhood in Boston proper, suddenly all those stories about saving shoveled out spaces with broken toilet bowls and vacuum cleaners stop being “cute” and “funny,” and take on a menacing tone. In most areas, moving the saver is a really bad idea. Silly me, the real test of storm endurance was just beginning. Not for nothing, in my previous neighborhoods, even though I had a driveway, my visitors had to park on the street and I’ve had non-snow parking situations where people left a nasty note, flattened tires, and once keyed a car. You break the unspoken rules of your neighborhood, and you take what’s coming to you. Oh, sure when I moved in this fall, these were the nicest people. Saying hello, organizing neighborhood leaf raking, even checking on my sister and elderly mother when they were out for a walk and taking rest. But the first spacing saving chair had sprouted; Boston winter’s equivalent of a warning volley shot across the bow. And with another 3 days of ridiculous temps from 7 to 14, there was no luxury of having the bright, day-after 35 degrees and sunshine helping me shovel out with a little snow melt. My monkey mind went into overtime. I didn’t want to get involved with saving a space. If I left and couldn’t find a space when I came back, what were my options? Where could I park my car? I was starting to miss the “snowmageddon” of 2015 (another made up weather word!). At least then I was master of my own domain and could shovel out on my own schedule, or at least when work demanded I show up in the office. I had managed to get as far as thinking I could take time off from work to dig out my car during the day, which was allegedly supposed to be warmer at 35 degrees. And if I couldn’t find parking when I got back, I could park in a pay garage in the next town and take the bus back to my house. But then I realized something. Something profound. I didn’t need my car. I take the train to work, I get my groceries delivered, and anything else can be walked or cabbed to. So I let it go, and then in the way the universe likes to mess with you, I went to check on my car on the weekend, still cold as you-know-what, and saw that the spot behind me was open. This gave me some space to start phase 1 of the digging out, and I cleared in front of, behind, and next to the driver’s door of the car. Then, when the kid come home later, he suggested that we clear off the snow on the car. Of his own volition. So we did. 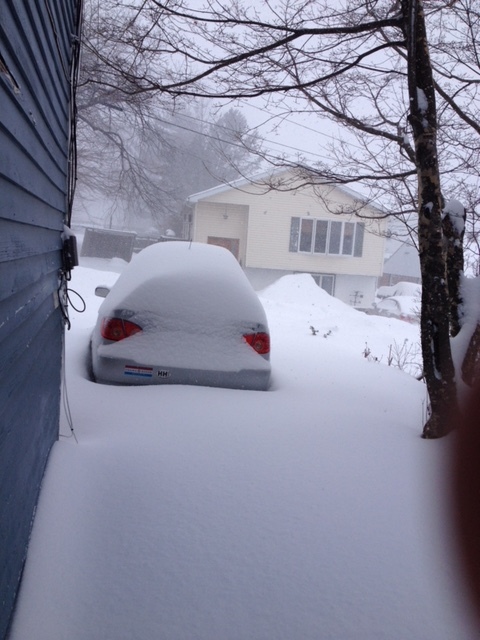 Now all that left is the snow pack three feet wide and 1 foot high between the car and the road. But I’m looking at above 35 degree highs for the next week, so ha on you, Winter! In the meantime, I learned that the worst that happens is people just move your space saver and take your shoveled out place. The city may also come by in the night and take the space savers because they technically aren’t allowed. That’s unconfirmed, but yeah, and naming snow storms isn’t supposed to be allowed either. People do it anyway. What? No nasty notes? No flat tires. How the heck am I supposed to blog with all this civility? Oh, I guess I just did. Just 53 more days until spring! 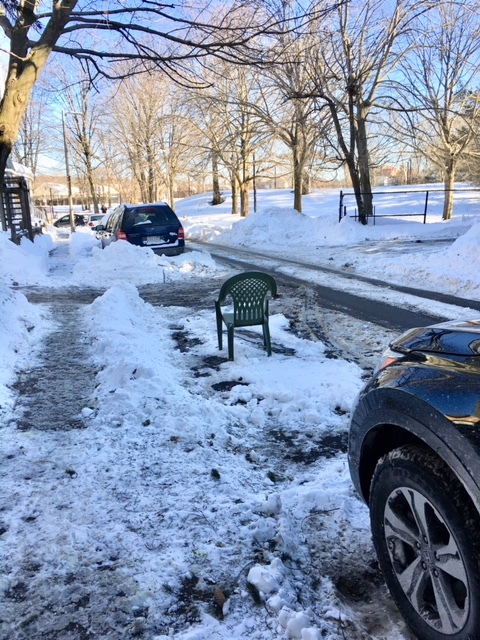 This entry was posted in Boston, Musings and tagged bomb cyclone, buried cars, chairs as parking space savers, snow shoveling, snow storm on January 8, 2018 by sdeden.